100% Riesling from vines planted in clayey limestone soil in Hattenheim and Rüdesheim. Manually harvested. Direct pressed. Fermented in temperature-controlled stainless steel tanks. Clarified by settling. Screwcapped. Reducing sugar: 4.1 g/l. 12% ABV. Quebec agent: Balthazard. 100% Riesling from organically and biodynamically farmed 40-year-old vines rooted in the gravelly, sandy, pebbly soil of Herrenweg. Manually harvested. The whole clusters were pneumatically pressed over five to eight hours. Spontaneous fermentation lasted from one to four months. The resulting wine was matured in a mix of stainless steel tanks and century-old oak foudres. Reducing sugar: 2.4 g/l. 11.5% ABV. Quebec agent: Symbiose. Founded in 1940, the five-hectare estate is located in the South Tyrol at the foot of the Dolomites, near Italy’s border with Austria. 100% Riesling from vines planted in 1998 and rooted in gravely silt and sand at 650-700 metres above sea level. The grapes are manually harvested in two passes; half when fully ripe and the other half two or three weeks later. The two harvests are vinified separately and blended before bottling. The clusters are not systematically destemmed. Fermentation takes place in temperature-controlled (20°C) stainless steel tanks and matures on the lees for six months. Sulphur is added only at bottling and then in minute quantities. 13% ABV. Quebec agent: Le Maître de Chai. Based in Mittelbergheim in the Bas-Rhin department, André Rohrer has run his eponymous eight-hectare estate since 1988, when he took the helm from his father. The estate, which has been in the family for eight generations, has holdings in three communes: Eichoffen, Mittelbergheim (including 18 ares in the Zotzenberg grand cru) and Barr. Though it abandoned herbicides in the 1960s and chemical insecticides in the 1980s, the estate has been certified organic only since 2001. 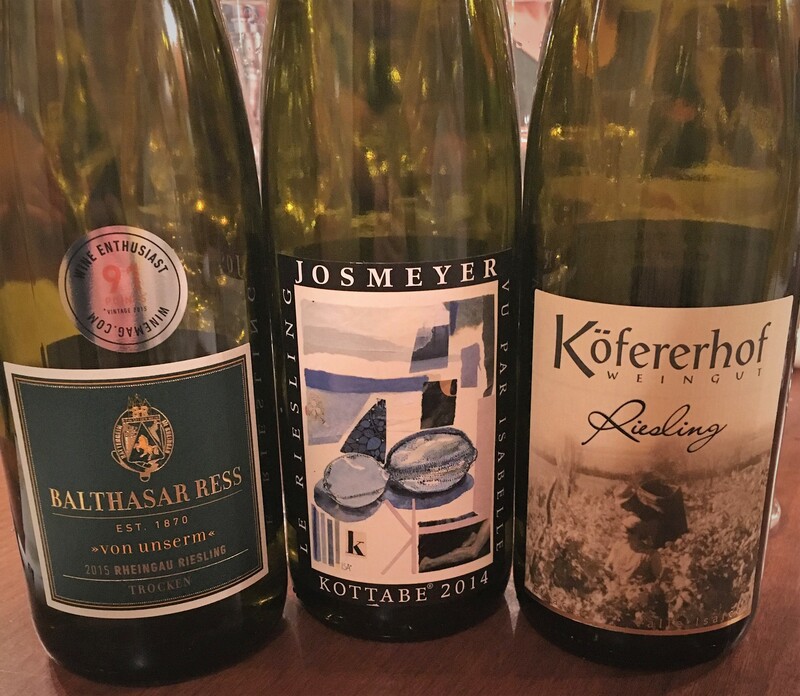 In recent years, Rohrer has been exploring new wine-making paths, including a line of natural wines, one of which we tried. The estate doesn’t have a website and technical information is non-existent on the Web, though it’s probably safe to assume that the wines are fermented with indigenous yeasts and made with minimal intervention. 100% Pinot Noir from organically farmed vines. Matured in oak barrels. 13.5% ABV. 100% Pinot Noir from organically farmed vines. Unfiltered and unfined. No added sulphur. 13.5% ABV. 100% Pinot Gris from organically farmed vines. Vinified like a red wine, with extended skin maceration. As Pinot Gris grape skins are dark pink in colour, so is the wine. Matured in neutral barrels. 14% ABV. The April 21st tasting featured wines represented in Quebec by Glou and was led by the agency’s prime mover, Jack Jacob. 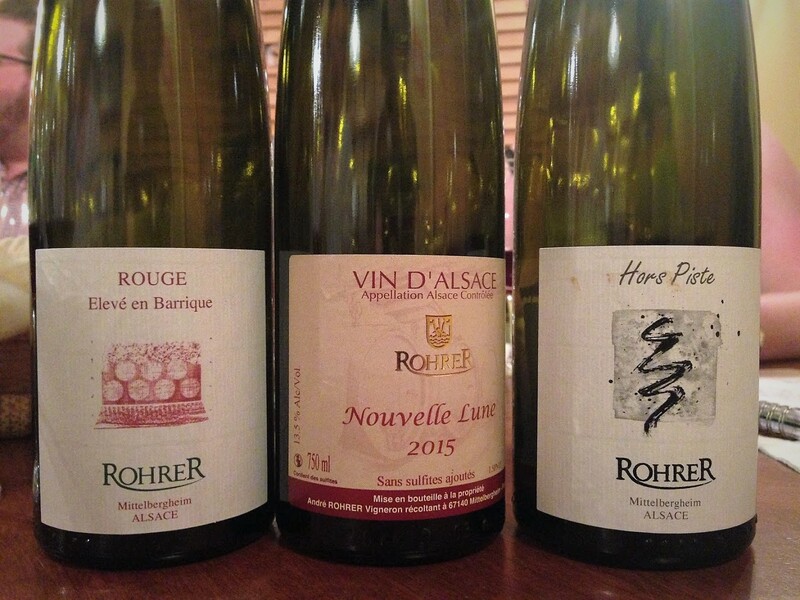 We started with a flight of four fine Alsatians. 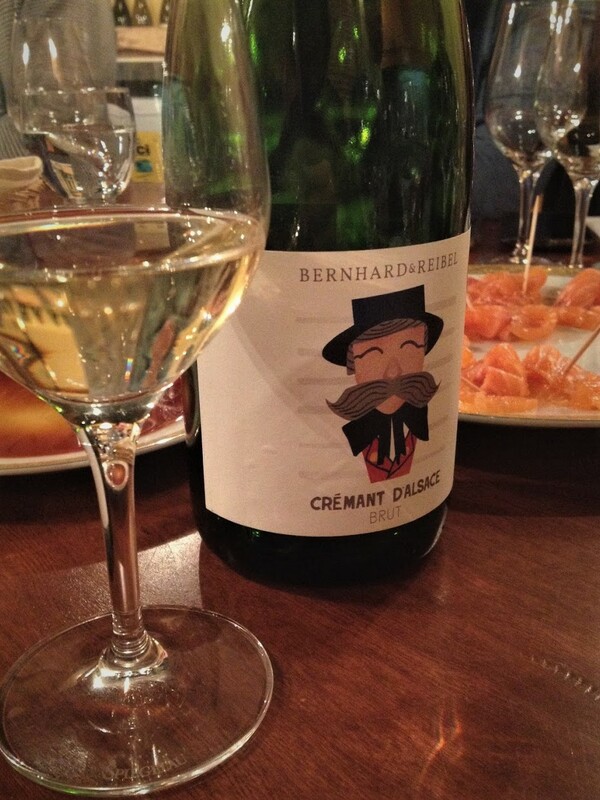 Created in 1950 and based in Ergersheim, Domaine Brand sits in the middle of La Couronne d’or, a swath of vineyards stretching from Strasbourg to Marienheim. The estate’s 10 hectares of vineyards are in the communes of Ergersheim, Osthoffen and Wolxheim. Farming has been organic since 2001 and certified biodynamic (Demeter) since 2015. Current winemaker Philippe Brand took the helm in 2008, following stints at Domaine de Montchovet in Burgundy and wineries in the Peloponnese (Greece) and Barossa Valley (Australia). He soon imposed a regime of non-interventionist wine-making where the only additive, if any, is small amounts of sulphur dioxide. 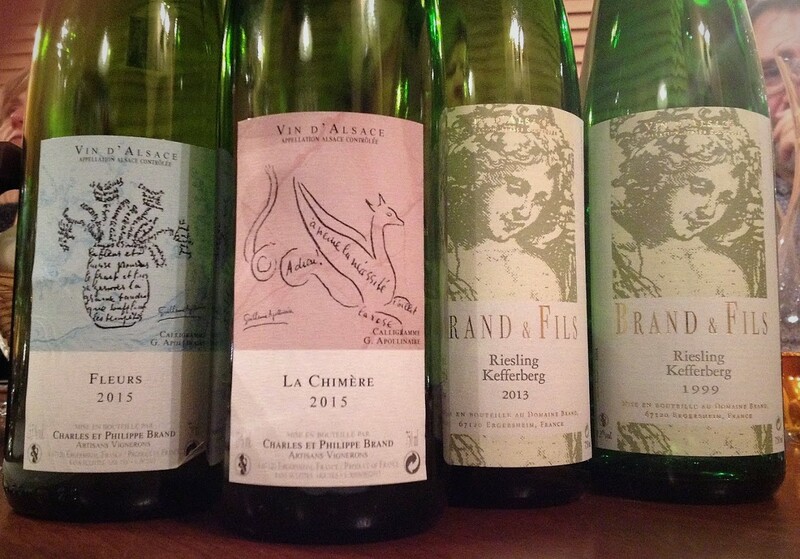 The estate makes a separate line of unsulphured natural wines under the Apollinaire moniker whose labels feature calligrams by the eponymous artist. 100% Riesling from the Kefferberg vineyard. Manually harvested. The whole clusters are gently pressed. Fermented (with indigenous yeasts) and matured in large barrels. 12.5% ABV. Quebec agent: Glou. One of the estate’s Apollinarie wines. 100% Riesling from the Osthoffen vineyard. Manually harvested. The whole clusters are gently pressed. Fermentation with indigenous yeasts and 12 months’ maturation take place in third- and fourth-fill barrels. Unfiltered and unfined. No added sulphur. 13% ABV. Quebec agent: Glou. One of the estate’s Apollinaire wines. 80% Pinot Gris, 20% Riesling. Manually harvested. The whole clusters are gently pressed. Fermentation with indigenous yeasts and 12 months’ maturation take place in third- and fourth-fill barrels. Unfiltered and unfined. No added sulphur. Residual sugar: 1.0 g/l. 13.5% ABV. Quebec agent: Glou. 100% Riesling from the Kefferberg. Manually harvested. The whole clusters are gently pressed. Fermented (with indigenous yeasts) and matured in large barrels. 12% ABV. Quebec agent: Glou. Not listed on the producer’s website, this appears to be a Quebec-only bottling. A blend of organically farmed Chardonnay and Pinot Noir (50-50 per the SAQ, 80-20 per the agency whose technical info for the wine is identical to the producer’s info for the non-vintage crémant with a different label). Manually harvested. Slow pneumatic pressing. The must is fermented with indigenous yeasts. Sparkled using the traditional method. Matured at least one year in the bottle on lattes. Lightly filtered. Reducing sugar: 6.9 g/l. 12% ABV. Quebec agent: Boires. First bottle: Pale gold with fine bubbles. The nose is described variously as “more apple than pear,” “caramel apple,” apple seeds, “sweat or maybe volatile acidity,” chalk, “rancio” and “wet laundry.” In the mouth, the wine is fruity and dry, with good acidity and a fine effervescence. Yet there’s a fuzziness about it, a touch of oxidation and a lingering impression of something a little off. No one is enamoured and one or two perceptive tasters suggest our bottle is defective. Plates of Scottish-Asian gravlax having been set out (thanks, Mike! ), we decide to open the backup. As is the Mo’ Wine Group’s longstanding tradition, our first tasting after the holidays focused on inexpensive and affordable bottles. Based in Costa Vescovato in southern Piedmont, Valli Unite is a 35-year-old organic cooperative whose members grow local grape varieties as well as grains, fruits, vegetables and livestock. Accurate information on this wine is hard to find. It’s not listed on the coop’s website and online reviewers tend to be all over place about its constituent grape varieties, production method (some say it’s a filtered Charmat-method sparkler) and stopper (some say it’s a cork). For all I know, there may be more than one bottling. This much seems clear: the wine we tasted was made from Cortese and may also contain some Favorita. The biodynamically farmed grapes were manually harvested. 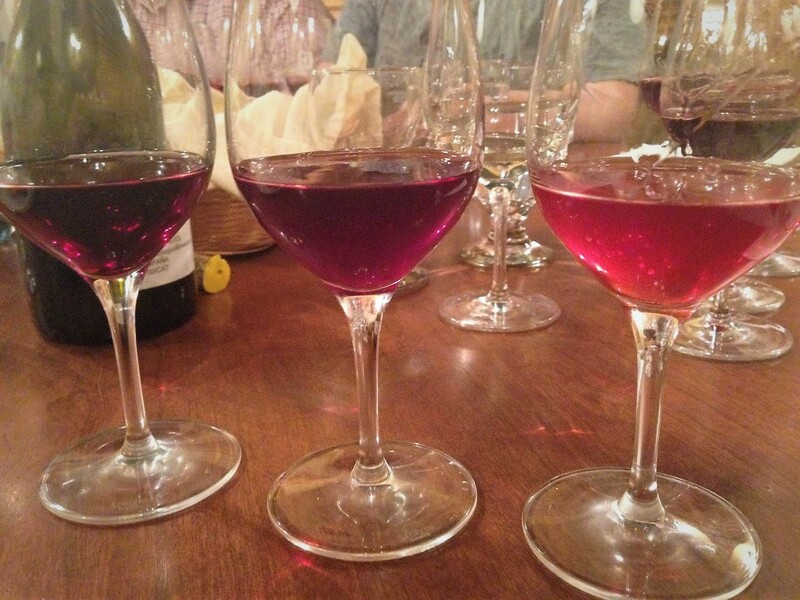 The wine was fermented with indigenous yeasts and bottled unfiltered and unfined. No sulphur was added during the wine-making process. The fizz is the result of natural, in-bottle fermentation. Vegan-compatible. Crown cap. 13% ABV. Quebec agent: La QV. A blend of Pinot Blanc (50%), Chardonnay (30%) and Pinot Noir (20%). The hand-picked grapes are purchased from growers, all of whom are converting to organic practices. This traditional-method sparkler was matured in the bottle for 24 months before disgoring. Reducing sugar: 5.1 g/l. 12.5% ABV. Quebec agent: LVAB. An ancestral method sparkler made from Gamay and Poulsard. The estate uses no pesticides, favours green cover over herbicides and turns to fungicides only on an as-needed basis. Immediately after harvest, the grapes are pressed and the must is fermented in tanks with indigenous yeasts. When the alcohol level reaches about 6%, the wine is chilled to near freezing, then filtered and bottled. Fermentation resumes as the wine warms, with the by-product carbon dioxide creating the sparkle. Residual sugar: 55 g/l. 8% ABV. Quebec agent: Mon Caviste. 100% Gewürztraminer from two parcels in the Silberberg lieu-dit. 12.5% ABV. Quebec agent: Mon Caviste. The Coteaux Bourguignons AOC replaced the Bourgogne Grand Ordinaire AOC in 2011. The estate is based in Côtes-de-Nuits. 100% Gamay from 40-year-old vines; farming is close to organic. The juice is macerated on the skins for four or five days. Fermentation in tanks is followed by 12 months’ maturation. 12% ABV. Quebec agent: Mon Caviste. Actually a blend of Pinot Blanc and Auxerrois, probably in near equal proportion, from several small plots of 25-year-old vines on marly Osthoffen hillsides. The estate’s viticultural practices lean organic. The grapes are manually harvested. The juice from the crushed fruit is gravity-fed into stainless steel tanks for fermentation with indigenous yeasts, which can last from three to eight weeks depending on the vintage. Temperature control is limited to avoiding heat spikes. Small doses of sulphur are applied at pressing, post fermentation and at bottling. 12.5% ABV. Quebec agent: Mon Caviste.